The Wonderful Xindi: Aliens Overdone or Underdone? In the third year of its run Enterprise proposed one of the most fantastic and intriguing ideas of the StarTrek universe or any other -- the Xindi. Here was an alien civilization composed of not just one species (Klingons, Andorians, etc.) or two (Romulans and Remans) but no fewer than six! Each was based on a group of creatures more or less familiar to Earthlings, for there were primates, sloth-like arborials, lizardy reptilians, insectoids, and aquatics that seemed to be a cross between fishes and amphibians, plus an avian species that had already become extinct and was represented only by a skull (actually a giraffe's). Neither the animatronic insects nor the swimming aquatics were on screen very often. In fact, none of the xindi are really revealed until well into the season, as the Enterprise crew searches for the perpetrators of a surprise terror attack on Florida. For technical and budget reasons, the pentad is mostly represented by the more humanoid components, the primates, arborials, and reptilians. Still, even with three out of the original six types of creatures in the lens, there was plenty of room for Enterprise to leave a dominant legacy in the realm of sci fi exobiology. on the three creatures most similar to humans certainly tilted the showing field from the very beginning, though some effort was made to compensate for this by giving the aquatics some very cool space vehicles that are featured towards the end of the season. The fact that the insectoids play second banana to the more aggressive reptilians and the aquatics have a somewhat similar role in regard to the primates and arborials gives a pretext for their underwriting. So does the detail that these two minor races are not to express themselves in anything like normal words, whereas the others can be scripted with a little help from accents and dialogue coaches. Nevertheless, the audience has a natural curiosity about these exotic beings that is never truly satisfied. 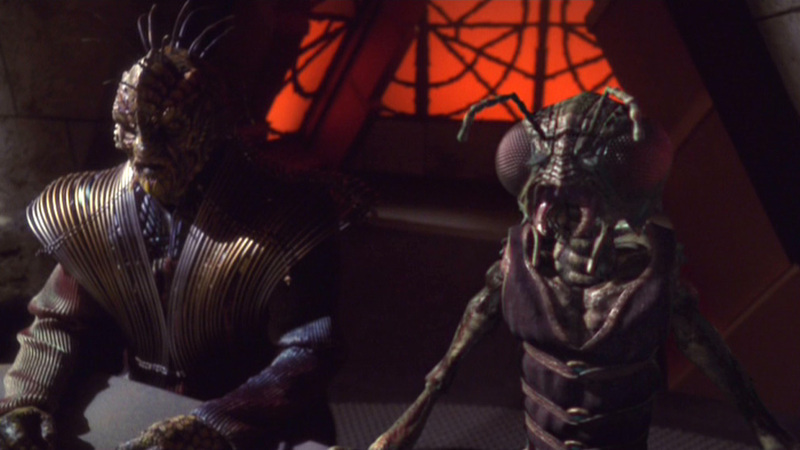 Surprisingly, the ponderous back story necessary to support the verisimilitude of the xindi is not very well elaborated or regularly sustained, with information confined mainly to two episodes and little morsels of revelation distributed unevenly, and with no obvious strategic plan, throughout the remainder of the season. There is another, even more glaring reason for the underwriting of the xindi, namely that they are not (as they are set up to be through at least five episodes) the principal villains responsible for the devastation of Earth. It turns out that they are merely the dupes of another even less clearly described race, the Sphere Beings. Thus the motivation for the xindi, except perhaps for the reptilians, is eventually reduced to a mistake. Indeed, the primates, arborials and aquatics eventually join the humans in trying to thwart the villains' plot for a second and more deadly attack on Earth. Even the insectoids assume a more or less neutral stance towards the end. The big mystery becomes not what makes the xindi tick, but why the Sphere Beings are behind the mischief. By this time in the arc, most of the audience had begun to lose interest in this gratuitous bifurcation. The error is emphasized by the diversion away from the xindi's own back story involving a civil war between the six races and the annihilation of their home planet. 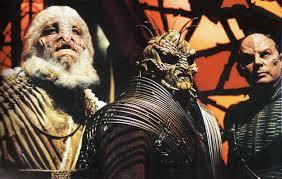 It is aggravated by a huge continuity problem concerning the xindi council chamber. This set is explained as a former stronghold of the avians before their extinction. Yet, if the extinction occurred at the time of the home world destruction, which the un-spaceworthy avians could not escape, how could they have constructed a complex on another planet? The burgeoning problem of continuity errors and ambiguity leads to late-season script details that try to resolve the incongruities. Thus, the xindi wind up being overwritten (badly) as well as initially underwritten. The original lack of concord among the xindi species, presented as a fait accompli when their delayed development belatedly takes place on camera, could have been a singular opportunity to deepen the treatment of all six life forms. And that was clearly called for, since the simultaneous evolution of six different and to some degree rival types of advanced organisms on one planet challenges scientific common sense. What a complex social situation, fraught with emotions that could captivate the spectator! Instead, the complex production and writing staff simply introduced the pretext of a civil war that posed more questions than it provided answers. We are asked to simply accept the premise that "there were these six different guys and naturally they didn't get along." This sort of "Chinese box" approach to composition is a poor one, since it progressively deflects and diminishes the attention of the audience. As the StarTrek universe expanded, one phenomenon that unfortunately manifested itself was that costumes and makeup, superb as they were, sometimes tended to push more important issues to the back burners. I am reminded of the experienced actor who had been hired to be a Klingon in an STNG episode, only to be unceremoniously dumped because his huge frame could not fit into the snug outfit Christopher Lloyd had worn in StarTrek III. It was he who had to remind the management that in the grown-up world directors and producers have to make the crucial decisions, not the Costume Department. (To their credit, the poobahs realized their error and reinstated him). In the case of the xindi, the admittedly breath-taking achievement of filming the plethora of alien beings was vitiated by the failure to develop them -- individually or collectively -- as characters. Ultimately, any sci fi extraterrestrial, from the mute xenomorph in Alien to the linguistically talented Drak in Enemy Mine, must succeed as a fully acceptable character with a coherent system of motivation, rather than as a disembodied image, no matter how stunning. 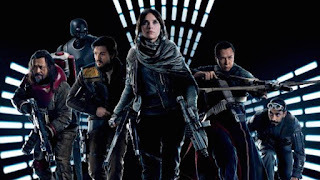 In the various Facebook groups devoted to Space Opera that I belong to, there have been many remarks of late about Rogue One that tend toward the negative. It is currently fashionable to "call out" any members one disagrees with, but this usually degenerates into the kind of monosyllabic flame war that i detest. So I choose to examine the question in the form of a little essay that will begin by giving some credit to my potential adversaries: their reaction is not completely unexpected or unnatural. In fact, they are right in perceiving that Rogue One is not a conventional space opera. For me, it is instead a combination of medieval Christian epic and heroic tragedy, two historically established genres the American public is almost completely unaware of. First, let's examine some of the main expectations of space opera. There are adventure, one-against-the-universe boldness, reliance on technical mastery or super powers, and of course a successful outcome. Add to this the tendency to project a hideous evil that is the embodiment of a psychologically concealed nemesis. Think Spaceman Spiff turning his untouchable teachers into monsters he can disintegrate. Space opera privileges a high degree of vicarious stimulation and enjoyment. The reader/viewer expects to confront and overcome the projected monster, gaining a sense of fulfillment, just as in mysteries, he or she accompanies the detective with the virtual certainty of unmasking the criminal and unraveling his plans. Nothing wrong with what Ronald Reagan, a reader of limited abilities, used to call a "ripping good story." The Star Wars universe, though, has never completely subscribed to this formula. Keep in mind that George Lucas began with a very dystopian future in THX 1138. A New Hope was a space opera grafted onto a Bildungsroman that featured Luke Skywalker in a scenario that resembled Joseph Campbell's idea of the mythic quest, a type of space-based Perceval more than a Buck Rogers or Flash Gordon. It adopted just enough of the Hollywood ritual of obstacles and plot points to fit on the big screen, but its parameters were much wider, leading into the stark dilemma of The Empire Strikes Back, which ends with Luke's ritual mutilation. 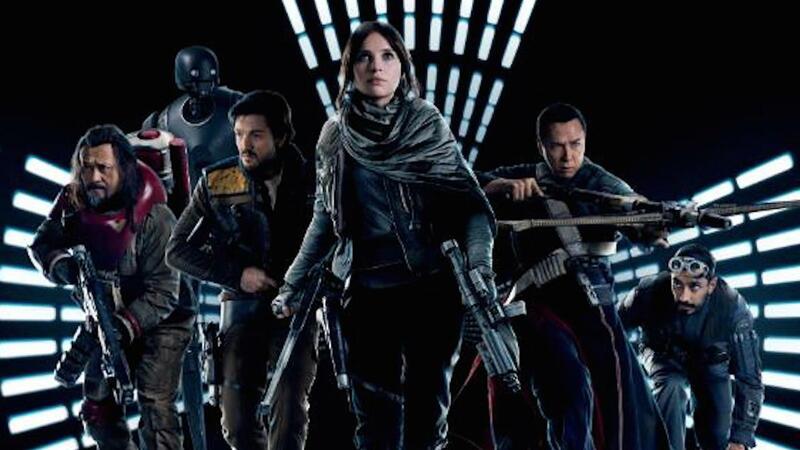 Rogue One begins in a very un-space-opera fashion, with Jyn being rather unwillingly recruited by Cassian into a mission to recover her father, who has already betrayed the Empire and is in turn the object of a secret assassination plot by the Rebels that Jyn is completely ignorant of. We are much closer to John Le Carre than Flash Gordon. As they assemble their unlikely team of paladins (a reverse of the sidekicks in The Song of Roland, complete with a Jedi equivalent of Bishop Turpin), Jyn and Cassian begin to meld together while at the same time delving into their covert selves. For it is only by coming to grips not only with their past, but also with their individual potential that the couple can assume the sacrificial importance that was the center of seventeenth-century heroic tragedy. Like The Cid and Chimene, Horatius and Sabine, the reluctant lovers have to realize a blood sacrifice even as they come together. It is this generic rooting that gives the film the psychological profundity that most viewers have praised. More than the fact that everyone sympathetic dies, it is the manner and context in which they die that really matters. Even had Darth Vader been able to seize that memory device at the last moment, dooming the Rebellion, Jyn and Cassian make the rebellion, previously a well-intentioned but morally tainted enterprise, worthy to succeed. As for the reactions of the negative audience, I will note one repeated reaction, "I was not impressed." This seemingly inarticulate and personal response is actually quite revealing. Emphasis on impressed. The space opera viewer typically seeks an impression, an essentially passive response associated with the vicarious thrill of participating with the "hero." This has always been a feature of Hollywood products and has dictated the almost universal presence of the Hollywood ending. To have the vicar (in the original sense of the word) die would break the contact with the impression. In the rare cases of endings where vicars died, there was generally a passing of the vicarious association: McMurphy to Chief in One Flew Over the Cuckoo's Nest, Spartacus to Varinia and Antoninus, Big X to Cooler King in The Great Escape. Instead of impression, Rogue One requires a process of transformation that shifts the emphasis from the putative heroic fact to the interior heroic assumption of worthiness, as in Pierre Corneille's heroic tragedies or, to come closer to our Anglo-Saxon tradition, in the fifth act of Hamlet ("If it be not now, yet it will be"). I hope I have shown that, however justified by habit some space opera fans may be in remaining unimpressed by Rogue One, the majority of its worldwide admirers are even more justified by growth in allowing it to transform them.